Have you heard the rumors and stories? The very jets that ferry people across the world are either purposefully or incidentally spilling mind-altering chemicals into the atmosphere. Or at least that is what the ‘chemtrail crowd’ would have you think. The other side of the coin, from the ‘contrail crowd’ is that contrails are normal and non-hazardous. It turns out that neither of these are 100% true. In this post we will take a look at what contrails actually are, whether they are a threat, and whether they could be weaponized. We’ll also look at why people either assume they are dangerous or brush them off as harmless. A contrail is usually formed from moisture condensating and freezing on small jet fuel exhaust particles. You have probably seen thousands in your lifetime; they appear as white streaks trailing the planes in the sky. Contrails can also be formed by turbulence resulting from a pressure differential. Well that was relatively simple- but what is a chemtrail? Chemtrails are intentional or inadvertent chemical sprays that can harm and potentially kill unsuspecting victims. There is a small group of preppers that believes that these are one-in-the-same. These preppers believe that the government is intentionally poisoning or altering mind states on a wide-spread level using commercial jets. While a chemtrail from a jet is certainly possible- it is not what you are seeing when you spot a commercial jet. Besides the physics reasons of why contrails occur, there are two other problems with this theory: motive and impact. Notice that spraying harmful chemicals purposefully into the atmosphere only can be considered for the last category- and a menacingly oppressive government at that. The problem is that there would be much easier, less visible, and less expensive ways to introduce chemicals to the population. Surely, a powerful government bent on punishing and controlling its citizens would understand this. The motive does not match the impact. If chemtrails scare you, you should be more concerned about your tap water or your well’s water table. Also, effective chemical sprays from aircraft have to be sprayed at lower altitudes. The dissipation in the atmosphere as the chemicals fall drastically reduces any chemical weapon’s effectiveness. Chemtrails are typically not the word you are looking for when talking about dangerous chemical weapons being deliberately sprayed on victims below. The combat scenario for this is known as ‘aircraft vector chemical spraying’. Chemical dumping, bombing, and spraying have been around in some form for ages, but were pretty standard in World War I and thereafter. 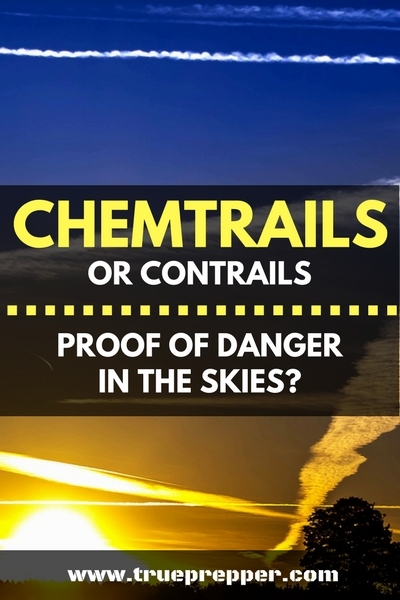 Contrails that you see in the sky are not the same types of chemicals that are weaponized and used to kill thousands indiscriminately in large swaths. Like we mentioned early, chemicals from that altitude would dissipate well past their effective size while falling. Some chemical weapons are even lighter than air, and would never fall to ground level without an additive and dilution agent. Let’s face it; jet exhaust itself is some pretty nasty stuff. You would not do well inhaling jet exhaust fumes and particulates- much like any car, truck, or boat but on a much larger scale. Even though these jet engines are massive and spew out some unnatural chemicals, we have to consider the altitude again. No matter what any jet is putting out, they are just too dang high to affect a localized area. Even if the argument is that it slowly builds up- there simply wouldn’t be enough of any chemical to make a difference as we inhale on ground level. Even though jets are not very efficient, cars and trucks pump out 10 times the exhaust annually. Going back to motive and impact: Would it not be easier to put additives into gasoline and diesel and see a tenfold impact at ground level? Everyone loves a good conspiracy. Moon landings, the twin towers, chemtrails- they all have the allure of being more ‘awake’ than the rest of the population. Conspiracy and prepping has often overlapped. I think this overlap has damaged public perception of preparedness as a whole- but that doesn’t matter much now. One of our goals at TruePrepper is to mainstream prepping as the common-sense way to approach tough situations in life. There are plenty of practical, grounded preppers that share our viewpoint and understand that the more people are prepared, the better it would be for all of us. That doesn’t mean I shoot down every ‘conspiracy’ on sight, since it is important to approach things with an open mind. Hell- I’m not even 100% convinced on the moon landing. My point is that we need to focus on the important threats that aren’t cooked up tin-hat theories. 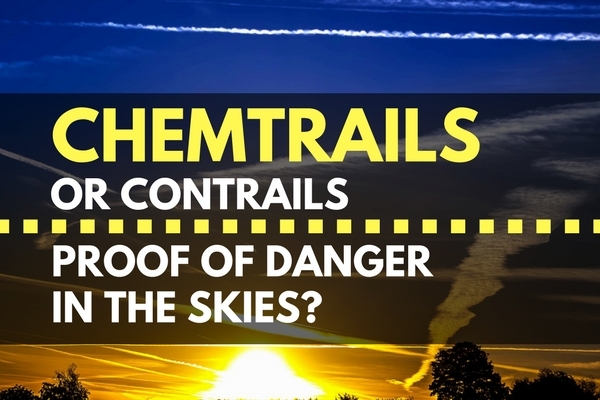 Chemtrails and contrails- we broke them down and shared our thoughts. We don’t plan on changing too many minds with this post, but it doesn’t hurt to address theories that damage how preppers appear to non-preppers. Be sure to catch up on actual threats to you and your family using the TrueRisk index. Don’t let the conspiracies distract you from being prepared and enjoying life. Keep exploring, stay prepared, and be safe. ← When Does a Flu Become a Pandemic? To someone who has watched the skies all their life and suddenly noticed the drastic change in the trails virtually overnight where I live – I am sorry but I think you are being naive. I don’t totally blame the governments however – they are just composed of puppeticians and many do not even realise what is going on. Our government in the UK was persuaded on board for ‘small scale’ solar radiation management testing by geoengineering scientists from the USA. The Science and Technology Committee did however call for regulation but they state themselves – in The House of Commons Report on the Regulation of Geoengineering 2010 – that it can’t be regulated due to lack of boundaries in the sky and to the fact that those carrying out the testing are doing so ‘in secrecy’. MPs I have spoken to are either oblivious or admit it is going on and say that there is nothing they can do to stop it. I blame the people pulling the strings – the likes of Bill Gates who is funding the work of the maniac Professor David Keith – whom I have had the misfortune of actually meeting following his presence in Cambridge trying to convince all our young scientists that geoengineering is ‘necessary’! This is nothing short of evil whatever their true motive. We can choose to grow our own food, distil our water – but we have no choice but to breathe the polluted air! I’m not familiar with UK laws, but I could see US climate engineers hopping across ‘the pond’ to test in the UK because SRM is not allowed here in the US by the EPA. Releasing sulfides in the atmosphere certainly may have health risks and even could change the color of the sky. Nevertheless, SRM has to be conducted at a higher altitude than any passenger or cargo jet flies. Sure there are plenty of concerns associated with that mitigation plan, but contrails have nothing to do with it. Of course it is going on in the US too! I have many hundreds of friends I have connected with there who are trying to get it stopped. Where is the law which states SRM is ‘not allowed’ in the USA? And where is the regulation that states ‘SRM has to be conducted at a higher altitude than any passenger or cargo jet flies’ because as can clearly be seen SRM cannot be regulated – sadly. I agree with you contrails have nothing to do with it – I see many planes leaving normal dissipating contrails. Then at similar altitudes we see planes which leave vast expanding trails which eventually white-out the sky. Everything the geoengineers state will happen are happening already. Even the ‘beautiful red and yellow sunsets’ which they list as a ‘Benefit’ of SRM geoengineering. I wish I could include photographs and the slides from Alan Robock’s presentation in Cambridge UK. Where oh where are all the men of this country? Everyone is scared to stand up against this. Sad state of affairs.